I bought a Flux from an offer on here and it broke (as they often do). I returned it and bought a Neo and it's vastly better, an incredible bit of kit. I don't think the Neo 2 offers much of an upgrade for the price difference, and certainly not for beginners like me. I thought buying a bike was the hard bit, yea i no its good but id expect a bike with it at that price. 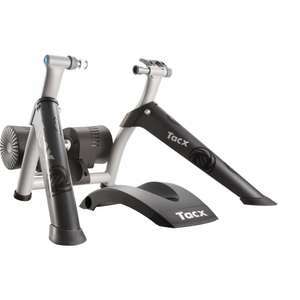 Excellent price for the best turbo trainer on the market. Neo2 is available now, but has seemingly had a few issues. I have had my Neo (one) for about 13 months now - no issues whatsoever. 700C should be fine. @whitehawk what size are your hybrid wheels? I didn't think there would be anything that doesn't fit with the correct settings. Ah right, let me know how it goes please. I’m hoping to use my 700c and not have to make any changes, it would probably put me off if I needed another wheel etc...just want it as simple as possible. Cheers. How long was delivery? Noticed it reckons 8 days or so. Can you use the tacx real life films with this? Found the answer - The films of the Tacx Cycling app cannot be combined with films of the Tacx Trainer software. I highly recommend this. Great for Zwift etc. Great price. This is a pretty good price for a decent wheel-on trainer. 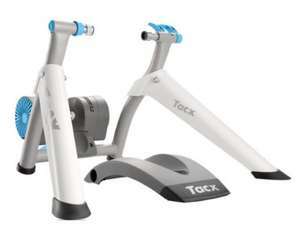 I bought the smaller brother of this (Tacx Vortex) at the end of 2017, used it in Zwift races and enjoyed it so much I traded up to a direct drive Tacx Neo (i.e. remove the wheel, and mount the bike directly on the trainer's axle). The higher end devices can be pretty pricey (~£1000), but they're more realistic, more accurate, more powerful, quieter and like this, great fun. Zwift is only one of the training options, there are plenty. Smart trainers are essentially capable of two-way communication with another device (such as a computer, phone, tablet etc) so instead of just sending your power/speed/cadence output for software to record, they can also receive instructions back and automatically change the resistance to simulate hills or for interval training. They're brilliant for increasing your immersion and engagement with your training programme IMO. As you spend more money, some other minor features are added but generally your money goes on better road feel, more resistance (ie the ability to simulate steeper hills) and better mechanics leading to them being more quiet in use. It’s a great price. 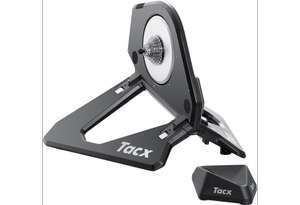 I only buy cheap smart trainers like Tacx Flow as they breakdown after a lot of use/wear, which is fine. Except the spare parts are so expensive- that it’s cheaper to buy a new one. turbo muin smart b+ woth power meter for me! 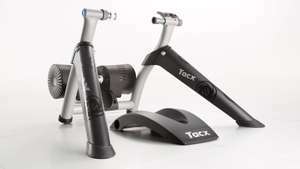 This is still the original version, but Tacx claim they've sorted out all the early problems (and have also put said internal changes into the Flux S which is the replacement but apart from long cage compatibility, exactly the same). It's categorically not true. I've already had two myself and there are many others in the same boat. I knew 2 people who sent the original version back, hadn't realised the version 2 was having problems, perhaps Tacx do it so that everyone realises how good the neo is by comparison. Great smart trainer in principle that is laughably unreliable in practice. Check the owners group on Facebook and don't believe anyone that says the problems are fixed on the 2018 revision. If anyone decides to take the risk, I strongly recommend NOT buying online, as it's very likely you'll need to take at least one unit back to the store for a replacement. I'm looking at getting into direct drive trainers, will this work with a Mountain Bike? I'm currently using a Concept2 Bike Erg but want the more responsive feel of gradient changes etc. Delivery date for me is Monday. I was looking at a direct drive trainer, mate works at Halfords so would get 25% off the cost which makes it very tempting. Just worried with the reviews. Excellent, but can you get one at a decent price. It's just been updated to be quieter, and it has a baby brother now too, the Kickr Core. That's all great, but it means holding out if you want a decent discount on either. Looking ahead, if you want to build the ultimate pain cave, replete with Wahoo's Kickr Climb, then you'll have to go with Wahoo as the Climb isn't compatible with another brand. (You can use the Kickr Headwind with any other brand of trainer however). Is the Wahoo Kickr a good shout? how has the trainer been? is it worth the investment? I’m ready to go bud, got the utility on my phone and Zwift from previous trainer! It comes with 30 days free Tacx Desktop software, so you may want to download and set this up beforehand, so that you can hit the ground running? Cheers OP! Purchased and have just set this up! Really pleased with it. It's a bit step up from my Tacx Flow Smart T2240! My old Tacx came with some basic software so assume it does, but if you’re spending this kind of money on a trainer I’d recommend Zwift as well. Does it come with software, or do you have to subscribe to Zwift? Exactly. This is the cheapest this has been. Plenty of cyclists are buying them. It's the new golf don't you know? The best trainer on the market. My old man has one, and it's great! Everytime I ride it, and go back to my Tacx Flow Smart I think about selling a kidney! You know the rules. If you have a better deal, link to it. Cheaper at Halford's today if you have British Cycling Membership. 10% off on top of the 10% today only discount. Post was correct, deal is still on today. Just been checking the Wayback Machine and it was £200-220 for much of last year, £190 at Christmas and then they sold ten for £160 on their eBay store in one day at the end of January (although you can't return to store if buying from them on eBay). So this does seem like a decent deal if you can get further discount through work or British Cycling. Yeah I've been looking into the Vortex prices on eBay etc. Not sure I'd feel the benefit of the better spec, and would rather have the comfort of a 2-year warranty and ability to take it back to the shop I think. Really good deal but would say you can pick up a used vortex (not some people's cup of tea) for the same.. bit higher spec. The Novo Smart is excellent for a budget trainer - sure, it's not a Neo or a Kickr but it's much better than the price suggests and at this price it's a bargain. Zwift is so much more fun than on a dumb trainer. The built in cadence sensor on it is rubbish though, get a dedicated sensor if you're doing something that needs it.